A Fashionable Indulgence by K.J. Charles is the start of her new Regency series, The Society of Gentlemen. Harry Vane, son of socialist revolutionaries, has just discovered that he could be the heir to a fortune. But first he has to win over his grandfather, who has big plans for the young man, including marrying his cousin to keep the whole fortune in the family. But first he has to pass muster with society, a not inconsiderable task for a guy who not only has no experience of the upper crust, but had been actively raised to disdain it. Enter Julius Norreys, a former soldier and current dandy, recruited by Harry’s relatives to outfit him properly and teach him the rules of being an aristocrat. Julius drills him on aristocratic relationships and titles, advises him on fashionable clothing choices and introduces him to the pleasures available to the relatively idle set. It’s all very My Fair Lady. What Harry and Julius did not expect was their strong mutual attraction. One of the aspects of Charles’ writing I like best is that she doesn’t shy away from the difficulties inherent to love between two men in the various historical periods in which she writes. And yet she manages to give believable resolutions to the dilemmas they face, both social and legal. The relationships she writes about are never going to be exactly what we would hope for such lovely couples (since there are plenty of things they’ll never be able to do together within the strictures of their societies), but their happy endings are both credible and uplifting. For history buffs and lovers of stories with realistic, believable conflict, I can’t recommend this book highly enough. And it looks as if the rest of the series will be similarly fraught with both political conflict and opposites-attract romances. Another 5 star read from K.J. Charles. There’s not a lot of eating going on in A Fashionable Indulgence. Just one scene in a French restaurant that doesn’t really mention any specific food. But that’s okay. Because they do drink. Oh boy do they ever drink. As Harry is feeling out his new role in society, he spends a lot of time in private clubs and attending social functions. And on more than one occasion, he and Julius get pretty disgracefully drunk, both together and apart. I’m not sure why I thought this need thyme-infused simple syrup, but I’ve been wanting to do something combining lemon and thyme since making this lemon meringue pie in January. It’s a good combination! 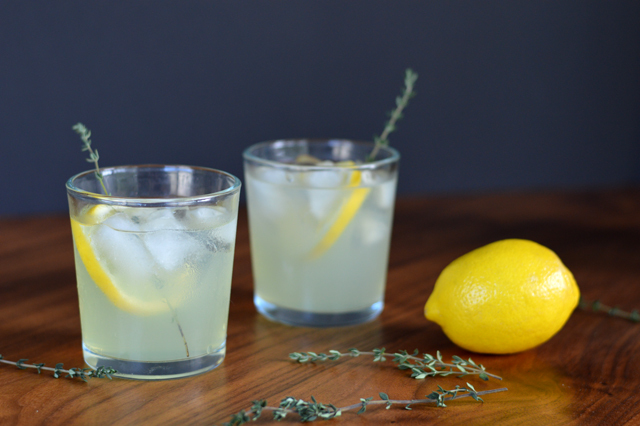 A refreshingly citrusy gin cocktail for enjoying the last dregs of summer. 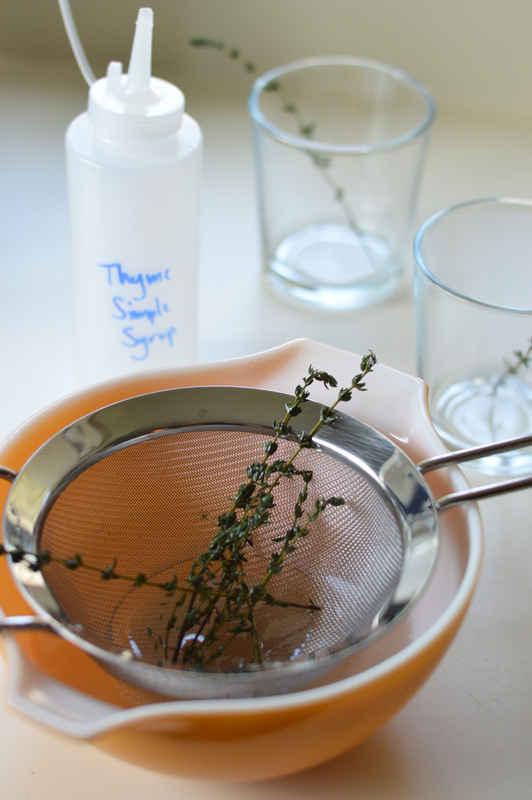 In a medium saucepan, combine water, sugar and thyme and bring to a boil over medium-high heat. Once the mixture boils, stir gently until all the sugar is dissolved. Remove from heat and let stand for 20 minutes. Allow to cool to room temperature then store in a tightly sealed container in the refrigerator for up to 4 weeks. 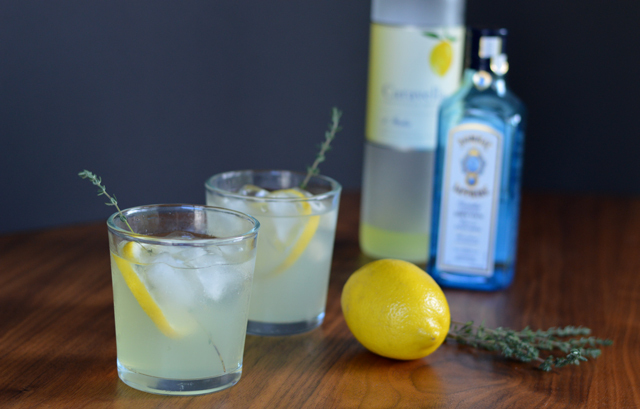 In a cocktail shaker, combine gin, limoncello, lemon juice and thyme simple syrup. Shake to combine. Strain into a highball glass filled with ice and top with club soda. 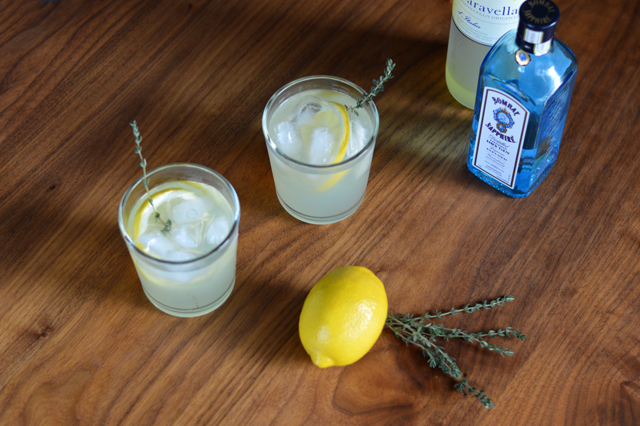 Garnish with additional thyme sprigs and a slice of lemon, if desired.